I know I'm late for this post, but better late than never? Plus, let me just say for all us hardworkin' ladies, the first week back after the holidays is always insane. Actually, scratch that, the first month back is insane! Nonetheless, I still had a ton of beauty favourites that I wanted to share with you guys. Some products you may have already seen in other beauty favourites, since they're cult favourites, and others will be new to you! I may not have even blogged about them before. Becca Shimmering Skin Perfector Pressed in Opal - Beautiful, amazing and just a little extra. I apply it lightly so it gives me a subtle glow, but you can also layer it on for an even more noticeable glow! Opal is a light golden highlight glow. I love it for all skintones, but it will definitely look amazing on skintones with yellow or gold undertones (like mine!). Let's be honest, it's a cult favourite for a reason. Makeup Forever Mat Bronze in 40 - Their darkest shade, weirdly enough but I love it for an all over glow. It has no shimmer, totally matte and it's a wonderful warm tone. Blends smoothly and goes beautifully with my light olive skin. No fuss, no muss. Hourglass Ambient Light in Dim Infusion - I love this blush, obviously, it's very subtle yet buildable (are you sending a theme here?) and Dim Infusion compliments my skin amazing. 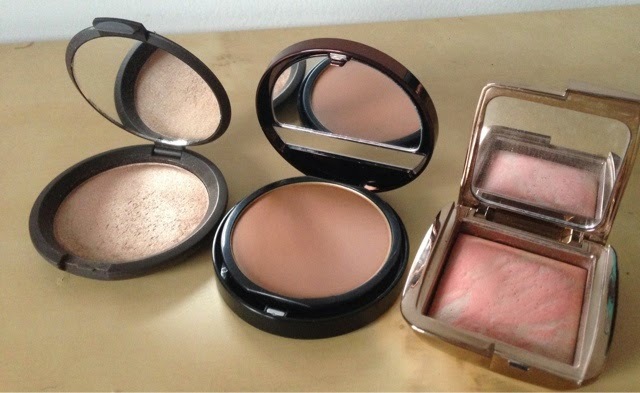 These blushes are built with the original Ambient Light powder infused into them. It's a muted coral colour with a subtle neutral highlighter running through it. I'd repurchase this over and over again. It's actually made me want to try the Hourglass Ambient Light palette, as I've done the research into figuring out how to even use it! 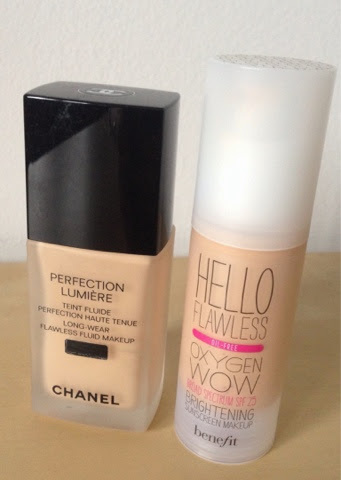 Chanel Perfection Lumiere in Beige 20 - This is my favourite light to medium coverage foundation. It's perfect for when I'm having better skin days. It's also great for the warmer season. It's got this beautiful glow-from-within look to it on the skin and just melt onto my skin when applied. Not to mention, it's also the perfect colour for my non-tanned skin. This comes highly recommended if you're in the market for a light, but still concealing, high-end foundation. Benefit Hello Flawless Oxygen Wow Brightening Foundation in Petal - I know I just posted this in my Winter 2015 Ulta haul, but I received a sample of it early Fall and I've loved it ever since. It's different from the Chanel since it gives a dewy finish and it's medium to high coverage concealer. I love that the Benefit Oxygen Wow is long-lasting. Even after an 8 hour day it hasn't worn as much on my face. However, my skin type is normal to combination, which helps my long-lasting situation. Bite Beauty Matte Creme Lip Crayon - I have two of these in Leche and Aubergine. I can't get enough, I want the whole line! They are creamy yet matte and they do not dry me out. The bottom of the crayon packaging even has a little sharpener. Yes, it does and I will definitely be doing a review/show of the product soon! 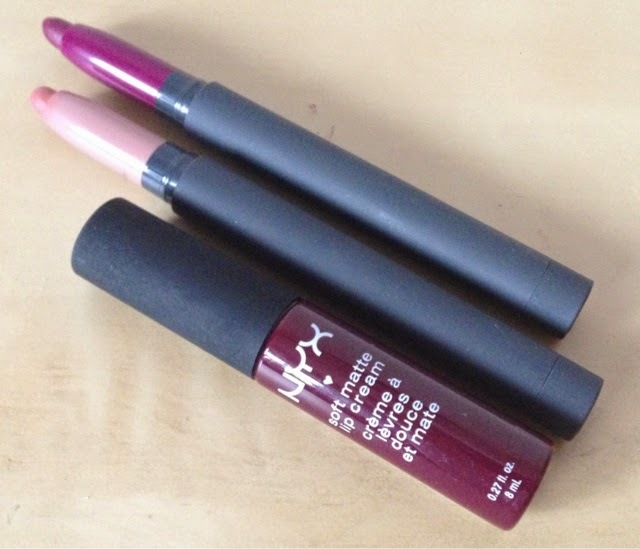 NYX Soft Matte Lip Cream - I only have one of these, but I'm loving it for a drugstore matte lip cream pick. It's the best formula in the drugstore that I've found! Mine is in Copenhagen and I'm loving the colour of it. I had tried my sister's tube well before I had bought mine. It stays on the lips and it dries beautifully matte. It also doesn't tug when you apply and it doesn't dry my lips as I wear it. I feel like most matte lip products really tug at the lips because they're so drying. 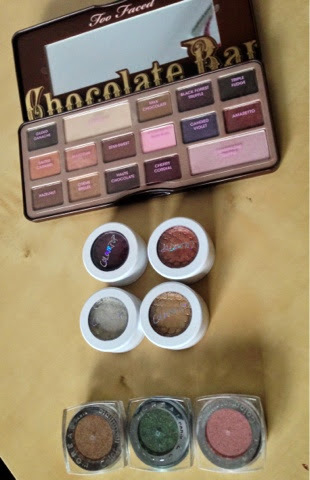 Too Faced Chocolate Bar Palette - I'm including this in my 2014 favourites since I bought it so late in 2014 and feel like I got on this bandwagon way too late. I always resist buying palettes. I feel like when you have too many the colours overlap and it just too much eyeshadow. I love picking my own colours and filling a palette on my own - except for the fact that it's more expensive that way. However, the Too Faced Chocolate Bar palette is like a palette Too Faced put together with every colour I would've picked out (except that pink shadow in the middle - no lie)... Why didn't I pick it up earlier? No idea, but happy to have it now! The colours are pigmented, buttery and go well together. This palette is easy to use and easy to travel with. My only qualms with it are that the names aren't under the shadows and it doesn't come with any brushes! L'Oreal Infallible Eyeshadows - For a drugstore brand, I love these pressed pigment shadows. I have like 5-6 but in this pictures I've showing you Sahara Treasure, Sage and Forever Pink. These are more expensive the Colour pop shadows but unless you use one of these colours everyday, you will not run out! They are so pigmented, last for a large chunk of the day and are easy to find all over the world (thanks L'Oreal!). Anastasia DipBrow Pomade in Dark Brown - Before this, I used wax and powder products for my brow, never a pencil or a mousse. But when these blew up all over the beauty world I had to try them - no matter the cost. (And these don't come cheap at 23$ each!) I'm happy I did because whenever I want a well-defined brow to go with a natural or made-up look, this is my go-to. Bye bye powder brow products. 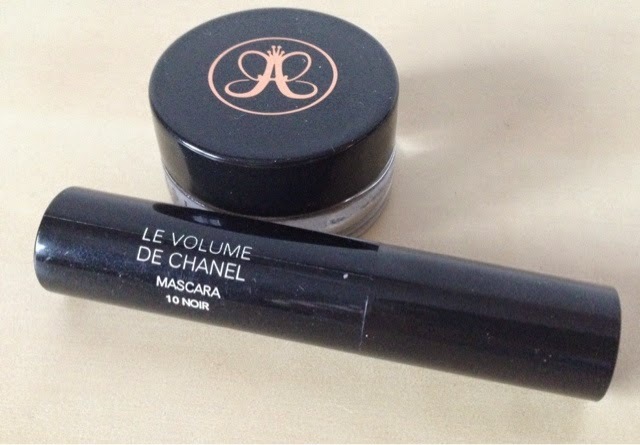 Chanel Le Volume De Chanel Mascara in 10 Noir - I only have samples of this, because I'm too cheap to buy the full size until I run out of them. Also because I can't talk myself into buying a full-size high end mascara... But this product is amazing for my lashes. They go from meagre black lashes to boom! va-va-voom volume lashes. I always pull this mascara out when I don't want to wear falsies but still want that length and volume. I'd recommend going to the Chanel counter and asking to try this out first or grabbing a sample, cause it is expensive! I haven't found a dupe for it, but it you know of any dupes to this, let me know in the comments below!! What have you been loving in 2014? Have you tried any of these products?